After a morning spent soaking up the cherry blossoms in Shinjuku Gyoen, Cindy and I set off for an afternoon of video games, anime and nerd culture in Akihabara (see a few highlights in the slideshow at the end of this post). We kicked things off with lunch, at a venue whose quiet vibe was at odds with the rest of the neighbourhood: Komaki Syokudo. This is another place that's quite tricky to locate - the address that Google Maps gave us was clearly wrong, but the Happy Cow directions and map were bang on. 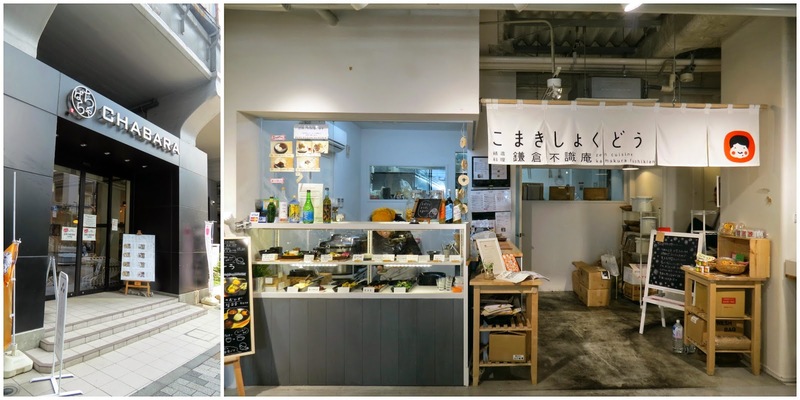 The restaurant is attached to a fancy grocery store under the train lines in the Chabara building, and it's well worth wandering through the store after you've eaten to marvel at all the interesting ingredients on offer. Komaki Syokudo is tucked over on the right hand side of the supermarket and is fairly unassuming. There are a handful of tables, a counter with clearly displayed food options and not much else. There's an English menu, which makes figuring out the system pretty easy. For a set lunch you order one dish from the middle shelf and two dishes from the bottom shelf; throw in miso soup and a bowl of rice and lunch will set you back 980円 (~$10.60). If you're hungrier, you can order the full set of 9 dishes for 1530円 (~$16.50). In either case, choosing brown rice over white will add an extra 150円 (~$1.60) to the price. The cuisine-style is shōjin ryōri, done a lot cheaper than the high-end versions we've had in the past. We split our meals - on the left above is fried gluten (top shelf) with a mushroom and greens dish plus a curry-seasoned lentil-cabbage dish. On the right, a crumbed rice croquette with a mushroom, carrot and bean salad plus another side we couldn't really identify, based on some sort of mashed root vegetable. It was simple but delicious, with one of the best miso soups of the trip and some nice seasoning on hand to add some punch to the rice. We wandered happily around the neighbouring grocery store afterwards, scoping out all the amazing ingredients on sale (but saving our money for the toy shopping to come). Komaki Syokudo is a relaxing way to prepare yourself for the hectic madness of the rest of Akihabara - it's the perfect starting or ending point for a few hours of wandering the streets. Both Japan Vegan and Sweet Potato Soul were impressed by Komaki Syokudo. Accessibility: There are a couple of steps up as you come into the building. The restaurant area is small and a little crowded. You order and pay at a high counter. The toilets are located in the nearby supermarket and are gendered.